As previously mentioned, the percentage of air present in consolidated lung is only around 10%. This means lung US, like in pneumothorax, does not rely on air/fluid artefacts but can image the pathology directly. Alveolar syndrome encompasses alveolar consolidation (fluid in the alveoli - infection, blood) and atelectasis (collapsed alveolar units secondary to bronchial obstruction (dynamic airway compression from weakened distal airways or reduced FRC or compression by surrounding effusion). Severe alveolar oedema does not cause a fully consolidated US appearance - there may be small areas of consolidation but the lung will not appear hepatisised. The multiple fluid filled alveolar units are separated by interlobular septa. If a consolidation reaches the chest wall (which over 90% do), the US beam will penetrate into the lung and be reflected back by each interlobular septa creating a tissue like pattern which looks much like the liver does on US. Placing the probe at the PLAPS point discovers 90% of consolidations (90% sensitive and 98% specific) but more liberal use of the prove over the chest will improve the sensitivity further. Lung sliding is often not present due to reduced lung expansion and sticking of the pleura due to an inflammatory process. As above the consolidated lung will be ‘hepatisised’ (looks similar to liver). Extensive consolidation (of a whole lobe) will allow the opposite plural line to be seen (8-11cm deep) with mediastinum deeper still with the aorta or IVC visible. A fully consolidated lobe may be seen floating in a pleural effusion. A fully consolidated right lower lobe surrounded by an effusion. IVC visible. Here it looks as if a chunk or chunks have been taken out of the lung (echo poor areas). These chunks will be bordered by aerated lung identified by sliding and comets. This is most suggestive of pneumonia. The border of the consolidated and aerated lung is not sharp. The shred sign. There appear to be chunks missing from the lung base. If a lobe is not completely consolidated then the transition from aerated to consolidated lung is often seen with respiration when the probe is in a fixed position. This is not because the consolidated bit of lung is filling with air but because an aerated area is moving into view. Often have adjacent B lines. If infective are more likely to have an indistinct boundary with peri-lesional B lines and deep comets (not technically B lines as do not arise from the pleura) deep to the far margins. A focal interstitial syndrome. If infarcts (PE) then are characteristically wedge shaped with sharp margins. Anterior consolidation in a patient with legionella pneumonia. More severe anterior consolidation in the same legionella patient with the probe in a different location (all lobes of both lungs were affected to varying degrees). These are white. They may be present in a consolidation or not so are specific but not sensitive and are present within an already highly specific sign. They are punctiform if transverse to the beam and linear if longitudinal. An air bronchogram which moves with respiration means that there is no bronchial obstruction and helps distinguish between consolidation and atelectasis (but not very well). Don’t mistake a bronchogram which appears and disappears (being moved by surrounding lung) with one which moves (gas flow within it moves it towards the periphery) This can be demonstrated with M-mode (and looks similar to the sinusoid sign). Static bronchograms make atelectasis more likely. Dynamic air bronchograms make pneumonia more likely. These are black (as they contain fluid). They are probably specific to pneumonia (expert opinion). They can be distinguished from vessels by colour doppler and the angulation of their branches. Combination of air and fluid bronchograms in a consolidated lower lobe. 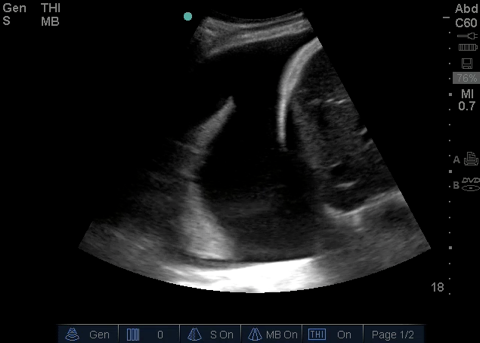 Punctiform air bronchograms (the bright white blebs) and fluid bronchograms (black) in a consolidated lower lobe. There is aerated lung present at the depths of the image. In neoplasia there will be increased vascularity with a disorganised appearance. Vascularity is normal in consolidation. 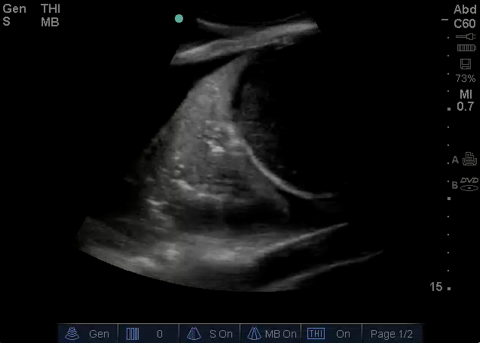 Scanning through the full volume of a consolidation will reveal if an abscess or necrosis is present. Straight forward consolidation has the tissue like pattern described above (with or without air bronchograms) whereas a necrotic area or abscess will appear as a hypoechoic, fairly regular, area. An air fluid level may be seen. Areas of necrosis are detected better than with CT. This looks very similar to consolidation with a tissue-like appearance. Non dynamic air bronchograms are suggestive (see above) but these are also present in 40% of cases of pneumonic consolidation. In obstructive atelectasis non dynamic air bronchograms will initially be present and then disappear as the air gets resorbed. Fluid bronchograms are a feature of pneumonia and not atelectasis. Almost all pleural effusions in critically ill patients will show consolidated/atelectatic lung underneath. Distinguishing the 2 can be done by tapping the fluid and seeing if the consolidation/atelectsis is improved (which it won’t be with consolidation). If the atelectasis is large (such as lobar collapse) there will be the expected associated signs of loss of volume such as raised hemidiaphragm and mediastinal shift (heart visible at right parasternum). The lung pulse (also called T-lines). Cardiac motion vibrates the motionless lung in time with contractions. This also rules out pneumothorax. T-lines in an ARDS patient without lung sliding (no consolidation here). The diaphragm is easily visualised if there is basal consolidation or an effusion. 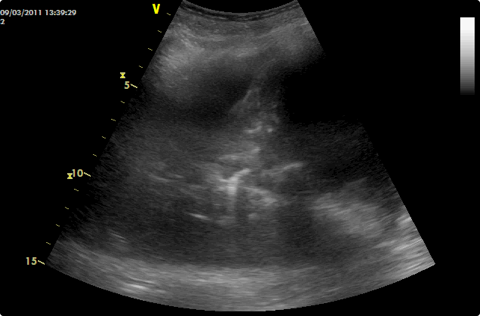 It is not clearly seen with normally aerated lung but will be identified by air above (on the left of the screen) and abdominal organs below (on the right). The diaphragm is raised if above the normal phrenic line defined by the BLUE hands. The normal inspiratory amplitude longitudinally is between 15-20mm. Low amplitude reflects atelectasis, low tidal volume or raised intra-abdominal pressure. Amplitude is not affected by effusion. Paradoxical movement indicates phrenic nerve palsy (this will also abolish lung sliding, elevate the diaphragm and show absence of inspiratory thickening). 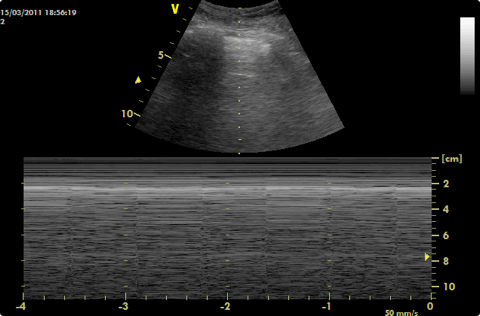 The right diaphragm is clearly visible between liver and effusion and its thickness can even be measured. A moving image will allow excursion to be measured. This may provoke anxiety but is advocated by Lichtenstein with sound reasoning. Accurate microbiological diagnosis is very important. The organisms will be within the lung tissue. If the needle is inserted into a consolidated lung the risk of pneumothorax will be very small. If lung sliding is absent it suggests the pleura are adherent further lowering the risk of pneumothorax. Each case should be done on a balance of risk/benefit. Large consolidation at accessible site. Air bronchograms absent of far from needle site. Use a 21G needle. Need to pull the plunger back hard and will only get a drop of material back. Will need the cooperation of your micro department for this proceedure. Check with US for a pneumothorax post proceedure. Lichtenstein says the above criteria mean a pneumothorax never happens and that the tap is positive in around 50%. Discussion with a chest physician who wrote the BTS guidelines for management of pneumothorax agrees that this is a safe procedure in his opinion. - The vascular pattern within the consolidation. B-D3-S4 (strong: level A) Lung ultrasound for detection of lung consolidation can be used in any clinical setting including point-of-care examination. Lung ultrasound is an alternative diagnostic tool to CT in diagnosis of pulmonary embolism when CT is contraindicated or unavailable.